The word ‘designer’ no longer has the connotations of being off-limits, flashy and, well, a bit pretentious, that it once had. Fashion has diversified and democratised in a way that could never have been predicted, as established, time-honoured brands now commonly share prime retail space with brave new contenders to the throne. And we can thank pioneering stores like Browns for this. The legendary London shop, launched in 1970, has been welcoming emerging designers into the fold since day one. It basically invented a new form of shopping, putting pieces by new graduates alongside world-renowned designers from the very offset. It’s fair to say its founders had their fingers firmly on the pulse – they were the first to introduce brands like Calvin Klein and Ralph Lauren to the UK, and champion the young Alexander McQueen. To this day, Browns is the go-to retail destination for those who want individuality and newness from their shopping experience. Combined with the e-commerce know-how of Farfetch – who it merged with in 2015 – Browns is sure to stay at the top of the game for years to come. To reveal its spring/summer 2018 edit, Browns packed its bags and took a trip to balmy Barbados with model Luca Lemaire and photographer Peter Ash Lee. The result? ‘Away we Go’, a sun-soaked shoot that shows off this season’s slickest looks and must-have pieces to perfection. Reflecting the style world’s adventurous mood, prints take centre stage, appearing on bold, patterned shirts by the likes of Saint Laurent, Marni and J.W Anderson. Slouchy tailoring proves to be the most versatile of warm-weather wear – as Luca proves in pieces by Jil Sander, Maison Margiela and Haider Ackermann. And pastel tones are in, as seen on everything from a dusty pink Versace bomber to boxy cut tees by Comme Des Garçons. Prints? Charming. The SS18 catwalks were bursting with shirts covered in graphic motifs, many taking inspiration from far-flung lands. You don’t have to go full-on Hawaiian, though — this koi print Saint Laurent number nails the trend, but its neutral, monochrome palette makes it endlessly versatile and wearable. The classic collar and relaxed fit mean it’ll look just as dapper under a suit jacket as with jeans. Every man needs a pair of smart trousers in his wardrobe. And it pays to splash out on the best because good tailoring never goes out of fashion. We’re confident these Prada strides, made from a fine wool and mohair-blend and featuring a natty front crease, will see you through a good few years in rakish style. Wear them with a tucked in T-shirt to channel the current eighties trend. This spring/summer, fashion’s obsession with logos is still going strong. This Raf Simons denim shirt is a low-key (but oh so cool) nod to the trend, featuring a luxe leather logo patch on the pocket. What’s more, it also ticks off the catwalk’s penchant for checks, so you’re getting two style wins in one. The relaxed fit means it’s just crying out for some artful layering. Sling it over a jumper or hoodie until the warmer weather hits. The shorts-with-everything look is going nowhere. Thankfully, it’s not all about the budgie smugglers when hitting the pool – get in on the act with a pair that don’t restrict your circulation, like these luxurious black swimmers by Orlebar Brown. They’re pleasingly streamlined, thanks to a concealed front fastening, and adjustable waist buckles mean you’ll always get the perfect fit. Wear with a slouchy tee and hoodie for a laid-back spring vibe, and with slides around the pool. Ice-cream weather is fast approaching. And it’s not just your stomach that’ll be getting in on the action – pastel shades are now a bona fide wardrobe essential. This pink cotton Maison Margiela hoodie is primed and ready to be your spring/summer go to. Team with shorts or wide-leg jeans for off-duty swagger. Or, if you’re feeling brave, wear with other shades of pink to ace the tonal dressing look. Crafted from cool, lightweight cotton and featuring a bold double stripe pattern, this long-sleeved Jil Sander shirt will see you through high summer in high style. Plus, it’s sure to be an instant point-scorer among your fashion-conscious mates – because when it comes to stripes, vertical is the new horizontal this season, didn’t cha know? The dark, eye-catching colourway will look mighty fine with lighter jeans and slip-on sneakers, or smartened up with an unstructured suit jacket. It’s time to enlist. Getting your hands on some camo print will secure you a spot among the ranks of menswear’s most stylish. And if it’s by streetwear heavyweight Stone Island – and also lets you in on the tech jacket trend – all the better. This overhead design, featuring an adjustable drawstring waist and foldover front pockets, is a true multitasker, so you can wear it with pretty much anything. Making it instantly worth the investment. If you haven’t already, make this the season you get your head in the game and pick up a baseball cap. No longer restricted to the realm of streetwear, caps were seen with everything from sharp suits to downtime duds at the spring/summer shows. This cotton Calvin Klein 205W39NYC snapback is among the most covetable of the bunch. Featuring an embroidered logo and curved brim, it’ll ensure you have the preppy look down. 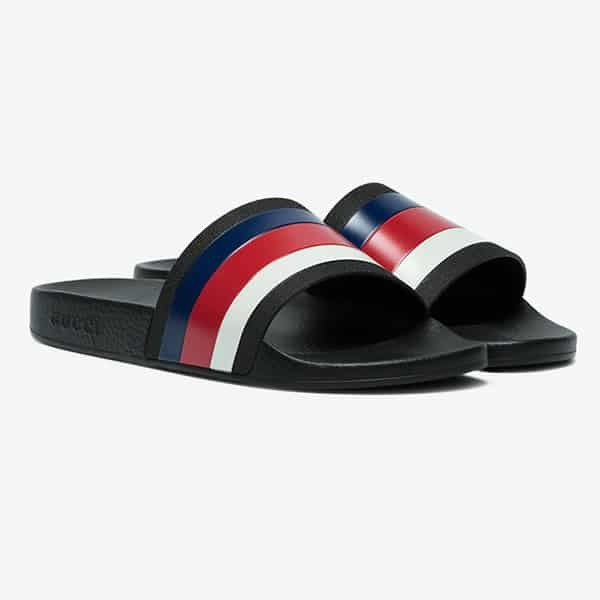 The quickest way to add immediate clout to your new-season wardrobe is to invest in a pair of statement sandals – and they hardly come more statement than a pair of Gucci pool slides. The only way to wear them this season is with socks (unless, of course, you’re at the beach). Keep things simple by teaming them with slouchy slacks, a simple T-shirt and a devil-may-care attitude. As far as summer accessories go, they don’t get much more classic than a pair of tortoiseshell sunglasses. This season, heavyweight Japanese brand Visvim – known for merging influences from the street and high fashion – has brought shades speeding into 2018, complete with tinted lenses, a sturdy acetate construction and deft touches such as metal details to the temple. Worn with workwear or sportswear, you’re sure to nail the man-about-town look. Dressed up or dressed down, a pair of stripped-back sneakers is a cornerstone of the male wardrobe, so it’s well worth splashing out on quality. Few make them like cult Stockholm brand Eytys. Handcrafted from supple white leather with double stitched rubber soles, these kicks are a lesson in minimalist perfection. Wear them with relaxed tailoring to take your suit game up a notch. Shop the full spring/summer edit online at brownsfashion.com.